Diabetes is a disease in which the body is unable to control the level of sugar in the blood due to insufficient amounts of the hormone insulin or an increased resistance of cells to insulin. The resultant high blood sugar levels can lead to a range of life-threatening conditions, such as cardiovascular disease. The prevalence of diabetes has been steadily increasing worldwide and it is now estimated that around one in every eleven people have diabetes1. Extrapolations suggest that by 2040 there will be 642 million people with diabetes, making it a major health concern across the globe1. Patients who are not able to produce any insulin are said to have type 1 diabetes, which usually presents in childhood, and requires regular insulin injections to maintain blood glucose levels within the normal range. Type 1 diabetes in particular is associated with an increased risk of developing cardiovascular disease2. Despite ongoing research, the underlying mechanism linking diabetes with increased risk of cardiovascular disease remains to be determined. However, it is known that lipid-lowering therapy reduces the risk of cardiovascular disease in patients with type 1 diabetes by around a fifth3. 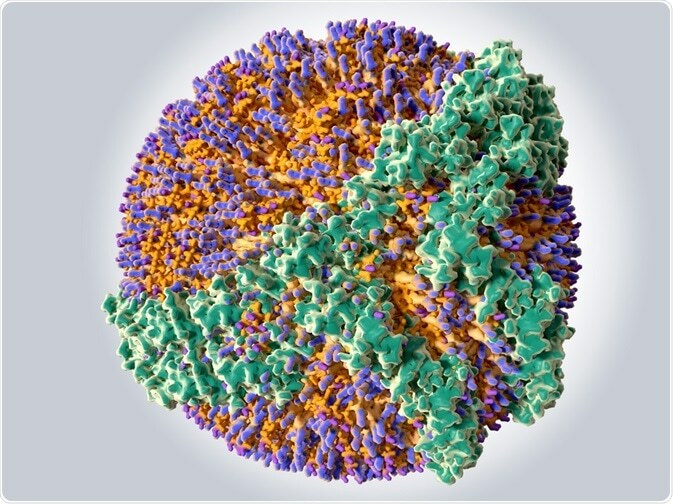 Lipoproteins are the means by which triglycerides and cholesterol are transported around the body. There are several types of lipoprotein, characterized according to the types of surface proteins, apoplipoproteins, they carry. The associated apolipoprotein also determines the function of the lipoprotein since it acts as the substrate for specific membrane-bound receptors. The most dense lipoprotein, high density lipoprotein (HDL), is typically considered to be cardioprotective since it removes cholesterol from the blood and transports it to the liver to be metabolized. Further investigations into HDL have revealed that HDL may also become complexed with apolipoprotein C3 that has the opposite function5. Apolipoprotein C3 prevents the uptake and breakdown of lipoprotein by the liver. In addition, it has been shown that in order for HDL presenting apolipoprotein A1 to return excess triglycerides and cholesterol to the liver, the apolipoprotein A1 must undergo a significant conformational change. Thus, it now appears that high levels of HDL per se do not necessarily indicate a low risk of developing stroke or heart disease. In order to determine the level of atheroprotection provided by HDL, the function of the HDL must be ascertained. The proportions of active HDL-apolipoprotein A1 can be measured using electron paramagnetic resonance (EPR) or fluorescent spectroscopy. The proportions of active of active HDL-apolipoprotein A1 have been shown to correlate with the extent of cardiovascular disease6. In a continued search for the etiological basis for the relationship between type 1 diabetes and increased risk of cardiovascular disease, the function of HDL was assessed in children and young adults with type 1 diabetes7. The proportion of active HDL-apolipoprotein A1 was assessed in 293 patients with type 1 diabetes (mean age of 13.7 years) and 111 healthy control subjects at baseline and again after 5 years. Lipoproteins extracted from blood samples were analyzed by EPR using a Bruker BioSpin eScan EPR spectrometer. The proportion of active HDL-apolipoprotein A1 was significantly lower in the diabetes group compared with the control group7 and remained relatively consistent from baseline to 5 years. Furthermore, in the diabetes group the proportion of active HDL-apolipoprotein A1 was significantly and inversely correlated with HbA1c. The reduction in the sequestering function of lipids by HDL was apparent soon after the onset of type 1 diabetes and persisted over time. It thus appears that type 1 diabetes leads to a reduction in the cardioprotective function of HDL. It is likely that this ongoing deficit in the breakdown of lipoproteins by HDL contributes to the increased risk of cardiovascular disease known to occur in patients with type 1 diabetes. Hero C, et al. Association Between Use of Lipid-Lowering Therapy and Cardiovascular Diseases and Death in Individuals With Type 1 Diabetes. Diabetes Care. 2016;39(6):996‑1003. van der Steeg WA, Holme I, Boekholdt SM, Larsen ML, Lindahl C, Stroes ES, et al. High-density lipoprotein cholesterol, high-density lipoprotein particle size, and apolipoprotein A–I: significance for cardiovascular risk: the IDEAL and EPIC-Norfolk studies. J Am Coll Cardiol. 2008;51:634–42. Kypreos KE. ABCA1 Promotes the de Novo Biogenesis of Apolipoprotein CIII-Containing HDL Particles in Vivo and Modulates the Severity of Apolipoprotein CIII-Induced Hypertriglyceridemia. Biochemistry 2008;47:10491–10502. Borja MS, et al. HDLapoA-I exchange: rapid detection and association with atherosclerosis. PLoS ONE. 2013;8:e71541.